Our 2007 Russian River Syrah comes from the same vineyard blend as its powerful 2006 predecessor, yet the wines are quite different; a testament to vintage variation. The mild 2007 late harvest period is evident in the brightness, elegance and purity of this wine; it clearly has coastal roots. Its gradual development in barrel has been interesting to chart. Initially closed and somewhat tight, it blossomed after a year into something quite classical as the layers of fruit and texture revealed themselves and absorbed the hillside tannins and coastal acidity. It taught us a valuable lesson of patience in the cellar. The wine is anchored in Saralee’s steep Trenton Station hillside vineyard which gives us wines that combine dark brooding camphor aromas and dense berry fruits. We ferment these blocks with some whole clusters to elevate the gamey side of the varietal and balance the broad hillside tannins. The Hoppe-Kelly vineyard offers plush, opulent rich blackberry fruit with great sweetness and depth. For the first time, some barrels from the ‘eddie’s patch’ block of this special vineyard add an extra dimension of floral aroma and velvety softness to the blend. Great purity of blueberry fruit and coastal freshness come in the shape of Gregori Vineyard, long a source of our ‘Jack Robert’s Run’ bottling. 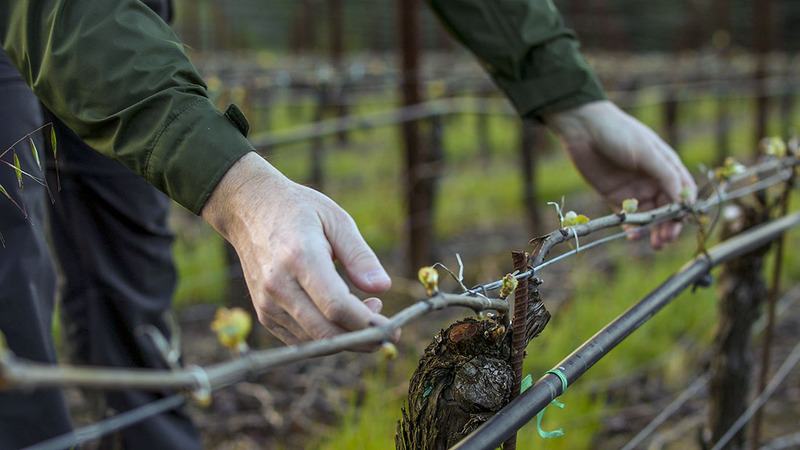 The blend is completed by the gorgeous purity of Dry Stack vineyard, a component that is arguably the most complete of the set with its aromatic purity, supple fruitiness and deep soft finish; a critical ingredient from one of our favorite growers. This is likely our brightest, most elegant and supple Syrah yet, which makes it a great candidate for current drinking and offers natural compatibility with a great range of dishes. It’s a Pinot-lovers Syrah for sure. I suggest opening a bottle on release (decant for an hour if possible) and enjoying the balance of your allocation over the next five years. Bright ruby purple color; intensely floral aromas of violet with ripe plum, black raspberry and soy notes with an edge of smoked meat. Lovely ripe fruit core: blackberry and boysenberry with roast coffee and dried thyme then a plush velvety mid-palate and balanced tannins and acid on the supple finish. Maintains freshness and elegance throughout with developing complexity in the glass.